Today I'm taking you to the ball park!! Have you seen this fantastic line? You can almost smell the peanuts and hotdogs right? I LOVE this line!!! Today I've used it to document my son's love of playing Catcher. I used the B side of Batter Up for my background. You can actually see the chain link backstop in my photo so I thought this paper would be perfect. Then I layered the B side of Ball Gear on sideways so I could use the lines for my journaling. Add some distressing, the awesome cardstock stickers and fun and EASY to use rub-ons and you're all done. Will you be at the Ball park this summer? Then you'll definitely want this line to document your memories. Hop on over to my blog and enter to WIN! I'm giving it away to one lucky follower. It's Wendi here and I'm sharing my first post with you up on the Moxxie blog. I am sooo excited!!! With it being summer, one thing that our family LOVES is baseball. My oldest son plays and we love going to his games. In fact, I have to say I love being a baseball mom and going to his games. I take a ton of photos each game, so the "At the Ballpark" line was perfect for all the pictures I have ready to scrap. I love how the line has the old muted feeling, which made it really easy to work with any colors that my son would be wearing. I added a few of the stickers from the line on the page. I also cut out some triangles to add a focal point to the title, along with some machine stitching. Unfortunately, his baseball season is over so I am anxious for fall ball to start up, for a whole new batch of photos to take. 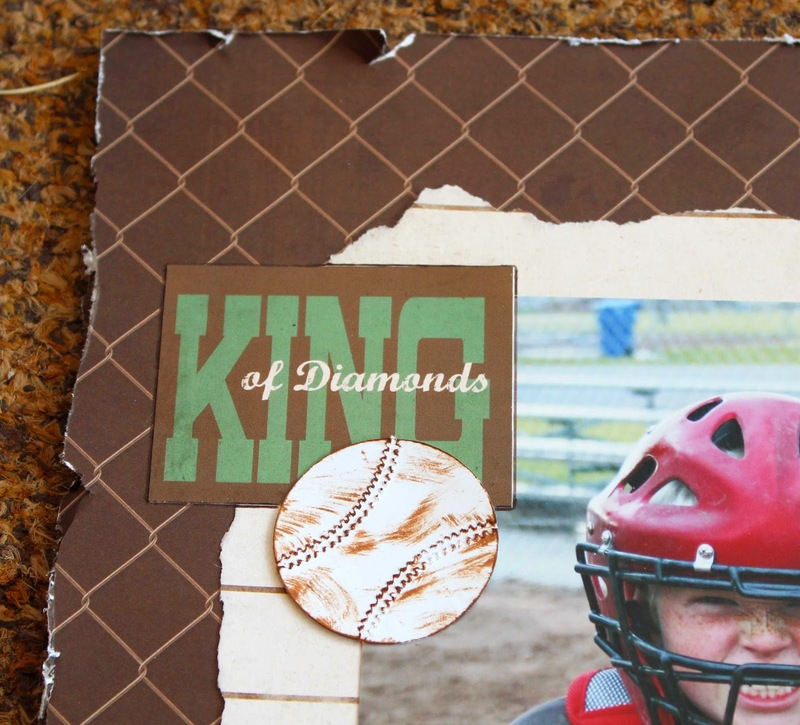 I recently created this one page layout using the At the Ballpark collection. When I realized I wanted to use more pictures from my son's All-Star team I decided to convert it from a single layout to a double layout. The basic design of the original layout itself is very simple. I cut one piece of Batter Up paper in half and centered the bottom piece horizontally on top of a piece of Ball Gear paper. 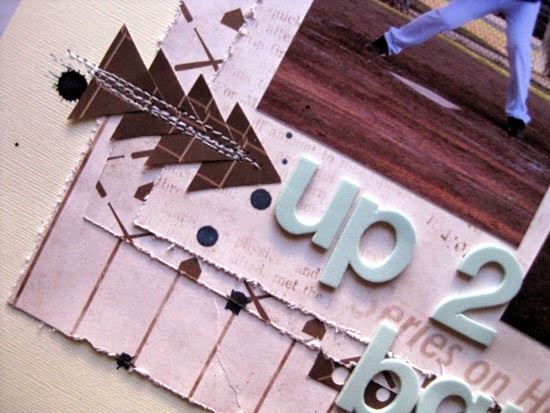 To create a 2 page layout, I simply took the remaining top half of the Batter Up paper and placed it on top of a 2nd sheet of Ball Gear. Then I played with picture and cardstock sticker placement. 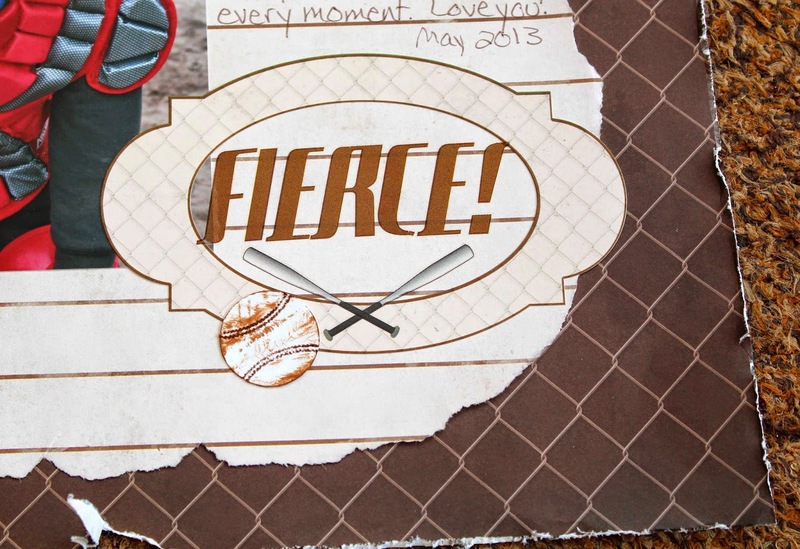 Welcome to Day 5 of Moxxie's At the Ballpark Inspiration Week! To wrap things up today we have layouts by two of our Moxxie Muses that are about as different as they can be! 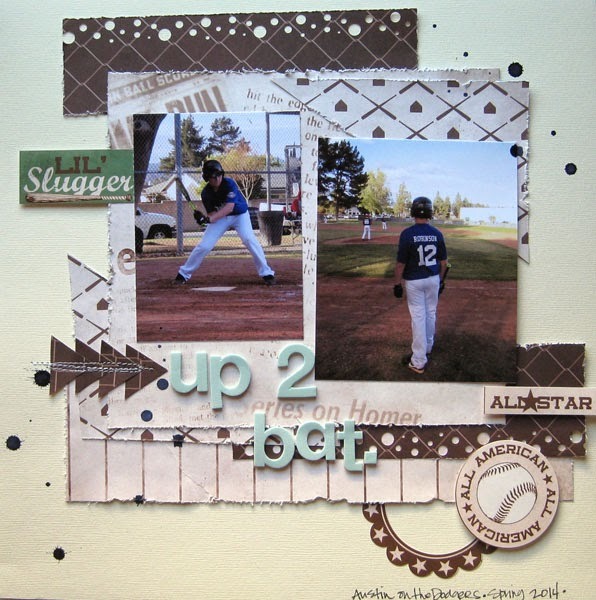 First up, designer Cathy Harper used layers to create this quick and simple layout in minutes! She used 3 papers from the collection, layered in angles, then added pops of color with washi tape and cardstock. She picked up on the stars from the Cardstock Stickers and echoed them with some die cuts and a trinket pin from Maya Road. 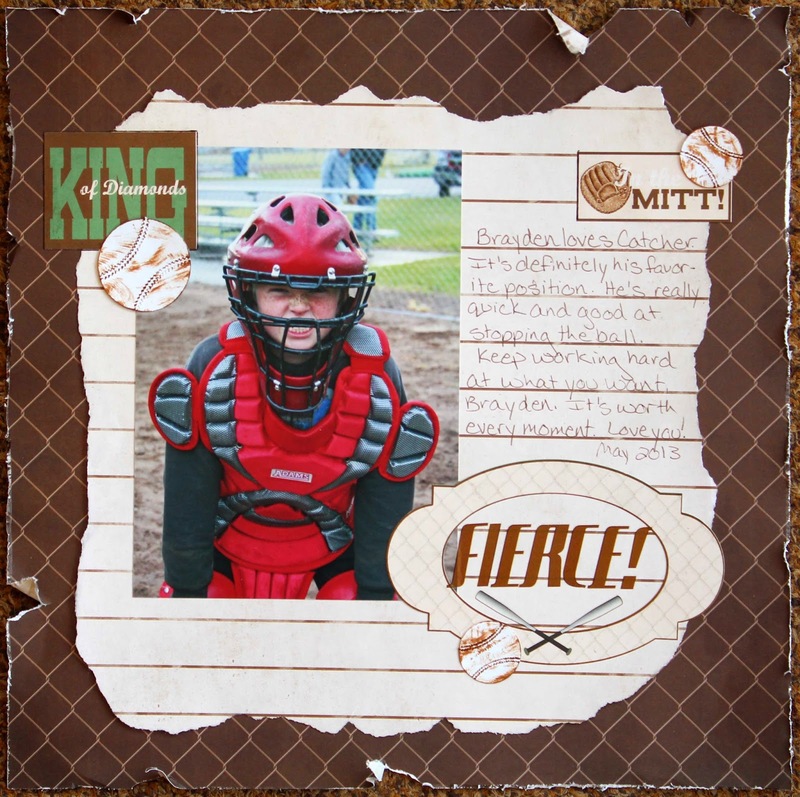 The sepia-toned photos take center stage on this fabulolus layout! Next up, we have designer Susie Bentz with a completely different look. She used 2 papers and some cardstock stickers from the collection and created this very linear layout. 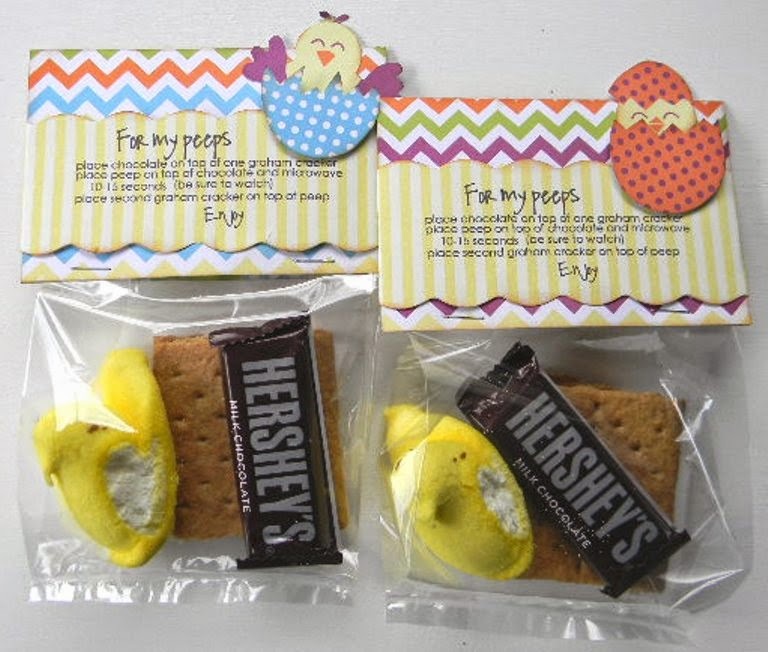 She kept her embellishments in the same color pallette as the papers and the focus on those - oh so cute! - full color pictures! If you missed any of the blog posts from this week, you can still go back and leave some love, one comment per day. Each comment is an entry! Also, I want to know if you follow us on facebook, so comment there and share this, At the Ballpark post, for additional entries. Last but not least, send your friends! Tell them to let us know who sent them and you get another entry to win! That gives you a total of 7 ways to enter, plus one for each friend that lets us know YOU sent them to the Moxxie Facebook page. We will announce the winner, here, on the blog Monday morning. Thank you so much for spending the week with us and we hope our projects have inspired you to create! Other products: Want2Scrap Finesse Swirl, ribbon, tag, wood embellishment, cardstock. 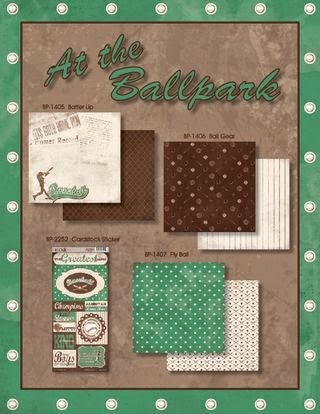 The Moxxie Muses are featuring the At The Ballpark Collection all week! More info at the bottom of this post! Today, Muses Rebecca and Patti are sharing their fabulous projects! Hey everyone, Rebecca here! I love going to the ballpark, and it was a special treat to take my kids to their very first game this summer! We went to see our hometown team, the Columbus Clippers, and my kids really had a great time. At The Ballpark was the perfect collection to scrap photos from the game. Today I'm sharing a pic of my daughter, chilling in the stands before the game started! Quick tip: Corrugated cardboard and embellishments really go great with this line, and work for both masculine and feminine subjects! Hi, it's Patti! Moxxie's "At the Ball Park" is one of my favorite collections ever. 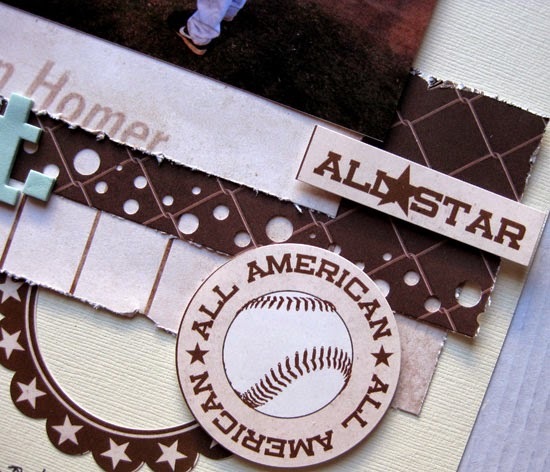 Baseball is actually what got me started in scrapbooking! I made an album for one of Patrick's coaches and was hooked! This page is our youngest during their State Championship tournament, which they WON!!! Used lots of different stickers on this one and some paper strips as well. I added some twine and decorative buttons as well. I used a piece of Kraft cardstock for the background, I thought it went well with the Sepia tone photo! There are so many elements in this collection. I've done several pages and have lots left!!!! I journaled with my black Zig marker. This page was lots of fun!!! The Moxxie Muses are featuring the At The Ballpark Collection all week! Come back every day this week to see more ballpark inspiration and leave a comment each day for an entry. Also, we want to know you follow us on Facebook, so comment there and share this, At the Ballpark post, for additional entries. Last but not least, send your friends! Tell them to let us know who sent them and you get another entry to win! That gives you a total of 7 ways to enter, plus one for each friend that lets us know YOU sent them to the Moxxie Facebook page. We will announce the winner, here, on the blog Monday morning. Inspiration week with At the Ballpark & a giveaway! Which is also one of my favorite places to be on a hot summer night. But you have to admit, Moxxie totally hit it out of the park with this line! The colors are fantastic!!! You could pair this line with any color you needed. So whether you're recording that adrenaline rich moment in major league stands or your favorite little player, this line is perfect for you! This is one of my favorite little players catching this summer. He had such an awesome season, full of fun. It doesn't get much better than that right? Now for the details on how to WIN this amazing line. My fellow muses are going to continue to show you how awesome this line is ALL week long!! So come back every day this week to see their ballpark wins and leave comments each day for an entry. Also, I want to know you follow us on facebook, so comment there and share this, At the Ballpark post, for additional entries. Last but not least, send your friends! Tell them to let us know who sent them and you get another entry to win! That gives you a total of 7 ways to enter, plus one for each friend that lets us know YOU sent them. We will announce the winner, here, on the blog Monday morning. Now, go forth, liking and sharing, but don't forget to come back tomorrow for more inspiration from my awesome fellow muses!